Ένα παραδοσιακό Αιγαίο ανεμόμυλος που έχει μετατραπεί σε ένα σύγχρονο, πλήρως εξοπλισμένο σπίτι το καλοκαίρι. Υπνοδωμάτιο με διπλό κρεβάτι, 2 παιδικά κρεβάτια στη σοφίτα και καναπές που φιλοξενεί 2 επιπλέον επισκέπτες. Λουτρό με ντουζιέρα, τηλεόραση, Wi-Fi, τηλέφωνο, πλήρως εξοπλισμένη μεγάλη κουζίνα, ιδιωτική αυλή με τραπέζι και καρέκλες για πρωινό, με θέα τη θάλασσα και το φημισμένο ηλιοβασίλεμα της Οίας. Άλλες εγκαταστάσεις περιλαμβάνουν ψυγείο, φούρνο, εστίες ηλεκτρικές κουζίνες,, πλυντήριο ρούχων, CD player, ραδιόφωνο, ηλεκτρικό σίδερο, καφετιέρα, ηλεκτρική τοστιέρα. Το ηφαιστειογενές νησί της Σαντορίνης είναι ένα παγκόσμιο top-5 προορισμό. Η Οία είναι το καλύτερο μέρος για να μείνετε στο νησί. Ήσυχη, με καταπληκτική θέα και εύκολη πρόσβαση. We enjoyed our stay at the windmill very much! Fabulous views of the sunset, close to the pool and the shops. Very impressed with the janitor, he came every 3 days to clean, change the sheets and towels. Plus lots of extras supplied - toilet roll, kitchen roll, washing up liquid, sponges, shampoo & shower gel etc. Kitchen well equipped to prepare food if needed. The air conditioning and WiFi were excellent which was a bonus! People have previously mentioned the stairs bring steep but it’s no different to anywhere in Oia. We stayed with 3 children (including a 3 year old) and had no issues. Supercharmerende med gode faciliteter, god placering og en fantastisk udsigt! Vi var meget tilfredse med vores ophold. Det var en særlig oplevelse at bo i en gl. mølle, og vi fik fin hjælp fra både ejer og caretaker, uden selv at skulle spørge om noget, både hvad angik transport og selve boligen. Boligen er meget charmerende, og vores unger elskede det særlige ved at bo i den specielle bygning. Dejlig tæt på indkøbsmuligheder i minimarked og tæt på poolen. Really unique place, specially in the Cyclades. Nice sunset view, though some clothesline’s in front. A little out of the way from main town. Inside a little uncomfortable, AC not enough for whole place. Really difficult to get in touch with guy with keys, no mobile signal there, he spoke little English. Never arrived for departure as agreed. Thank you for taking the time to write a review. We take all comments under serious consideration. Very cool place with great views, would highly recommend. Tolle Aussicht ! Kann man sicher weiterempfehlen ! Sicher einer der schönsten Plätze der Insel !!! When looking for a place to stay on Santorini for a month, I found the "Sunset Windmill". After confirming the dates, I had the opportunity to "chat" with George the owner about the windmill and my plans on the island. Needless to say, the "Sunset Windmill" is everything advertised and more! 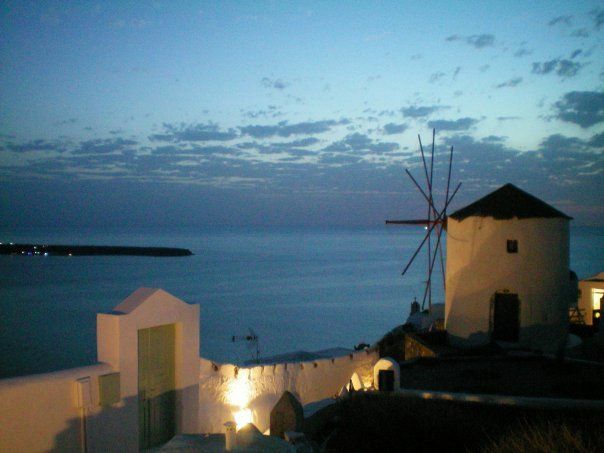 Its located in OIa, the best location to watch the sunset, about a 15 minute bus ride from Fira. The janitor meets you at the shuttle drop off and carries your luggage to the mill, after a quick orientation, your stay begins. Its very clean and well maintained. It has all the comforts of home and more! The pool is near and plenty of restaurants, shopping, and markets nearby. Although it has one shower on the main floor, and it was just me most of the time at the windmill, I did have a couple guests stay for a week and the one shower was not an issue at all. The owner's wife checked in from time to time to ensure everything was okay. I should also add that the owners supplied a document on things to do/where to eat on Santorini. The month flew by and the hardest part was leaving the "Sunset Windmill", but I will definitely go back again. I should also add that I had the opportunity to meet George ,the owner, on my connection from Santorini to Rome, at the Athens airport. We had a great lunch and I learned a lot about the Sunset Mill, Santorini, Greece, and the owners. Don't miss the opportunity if you have the chance. 5 Stars +. We thank you for your kind words. It was a real pleasure meeting you George! Reservation can be made with a 25% deposit calculated on the total rent. Please ask for details.